As the Buddha taught over two and a half thousand years ago, there are many benefits to following a vegetarian lifestyle – both for us and for other beings as well. Today, so many centuries later, the Buddha’s words are as powerful as ever. Even modern science is starting to validate this profound teaching. In recent years, the world has become a very unbalanced place. No doubt, part of this imbalance is directly caused by the human consumption of meat. In industrialized countries, the meat industry is guilty of causing huge environmental problems: methane gas produced by cattle is contributing to global warming; acidic pig feces pollutes subterranean aquifers; over-fishing is emptying the oceans of their fish; livestock have recently even spread serious and fatal illnesses to humans! 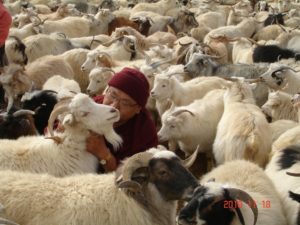 First, eating meat is contrary to our inherent Buddha nature which is, in essence, a love for all sentient beings throughout space; Second, eating meat is unhealthy, especially in the long term. By not eating meat, a person can lower their chances of getting heart disease, high blood pressure, cancers of all sorts, infectious diseases, the so called ‘Mad Cow’ disease, etc. Therefore, my appeal to you is this: give up eating meat from today onwards; if you feel you cannot do that, at least eat less meat. It might take several tries to give up eating meat, as all habits are hard to break.